Fly at up to 40mph (64kmh) or for as long as 27-minutes.True 4K, fully stabilized ensures smooth footageActiveTrack, TapFly and other smart features make professional looking video effortless. DJI Mavic Pro Platinum Fly More Combo. DJI Mavic Pro Platinum Fly More Combo Product Highlights: Integrated 12MP 4K Camera 3-Axis Gimbal Stabilizes Camera 4 dB Quieter Than Mavic Pro GPS- & Vision Position-Based Navigation DJI GO App-Based Control and Monitoring Top Speed of 40 mph in Sport Mode Up to 30 Minutes Flight Time Tap- and Gesture-Based Commands Three Total Batteries / Charging Hub Mavic Shoulder Bag While we aim to supply accurate product information, it is sourced by manufacturers, suppliers and marketplace sellers, and has not been provided by Overstock. DJI Mavic Pro - PLATINUM - Fly More COMBO! Store: Rakuten.com Condition: Brand New Price: $2384.00 Total Price: $2384.00 Buy It from Rakuten.com DJI Mavic Pro Platinum Fly More Combo CP. PT.00000069.01 + FPV Racing Goggles + 2 DJI Intelligent Flight Battery for Mavic Pro Platinum (5 Total) + Carrying Case and Much More. Store: roqworx Condition: Brand New Price: $1399.00 Total Price: $1399.00 Buy It from roqworx No returns. 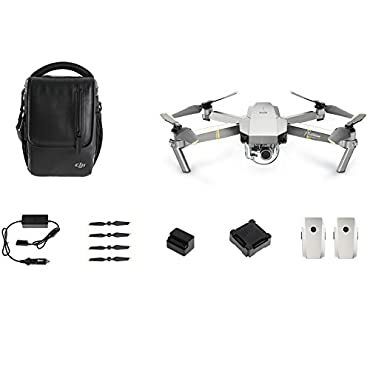 Store: Newegg.com Condition: Brand New Price: $1299.00 Total Price: $1299.00 Buy It from Newegg.com DJI Mavic Pro - Platinum - Fly More Combo! Last updated: April 20, 2019 at 21:08 EST. Pricing information is provided by the listed merchants. GoSale.com is not responsible for the accuracy of pricing information, product information or the images provided. Product prices and availability is subject to change. Any price and availability information displayed on amazon.com or other merchants at the time of purchase will apply to the purchase of the product. As always, be sure to visit the merchant's site to review and verify product information, price, and shipping costs. GoSale.com is not responsible for the content and opinions contained in customer submitted reviews.